City officials were joined by Michael Gay, SVP of Economic Development for MadREP, and Melissa Hunt, Regional Economic Development Director for the Wisconsin Economic Development Corporation (WEDC). The project includes an approximately 15,000 s.f. 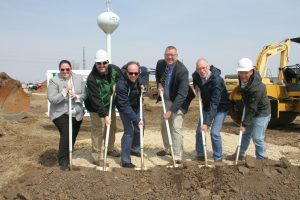 research and development facility related to the manufacturing of high-performance agricultural harvesting equipment that will open in fall of 2019. MacDon’s growth plans for the next five years could result in 20 highly skilled, competitive wage jobs in the Madison Region. For 70 years MacDon, a subsidiary of Linamar, has been a world leader in technology, innovation, and manufacturing of high-performance harvesting equipment. MacDon products are distributed and supported worldwide from offices in Canada, the United States, Australia, Russia, Brazil, and Germany. For 70 years MacDon has been a world leader in technology, innovation, and manufacturing of high-performance harvesting equipment. Their harvesting history is rooted deep in the rich prairie heritage of Winnipeg, Manitoba, Canada. MacDon products are distributed and supported worldwide from offices in Canada, the United States, Australia, Russia, Brazil, and Germany. MacDon’s relentless pursuit of improvement is driven by their desire to make harvesting easier and more productive for farmers. Working directly with producers and custom harvesters in the toughest real-world conditions; this relationship guides MacDon to pioneer industry-leading innovations like the FlexDraper®. MacDon has a worldwide reputation for excellence as The Harvesting Specialists and is proud to make equipment that help producers harvest the crops that feed the world.